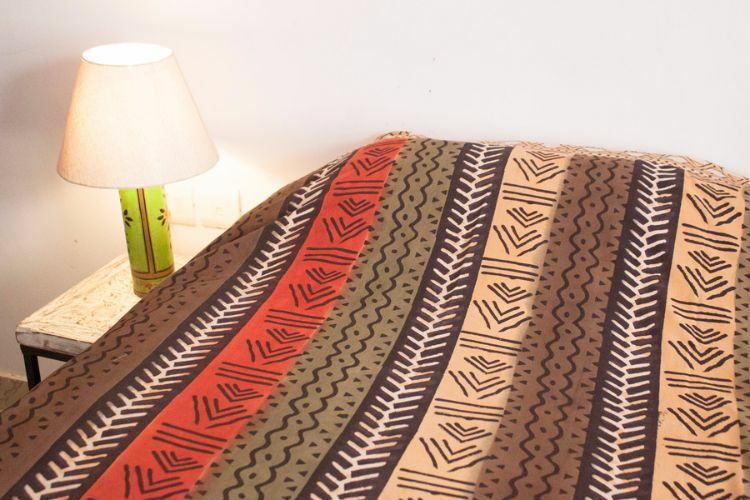 Hand block printed cotton bedspread and pillow covers. These have been block printed in Sarthik Manav Kusht Ashram, a leprosy community in Jaipur, N. India that provides employment and income for people recovered from leprosy and their families. Block printing is a traditional craft in Jaipur. Double: Bedspread, width-220 cm x Length-274 cm. Pillow Cover, width 45 cm x length 71 cm. Single: Bedspread, width-140 cm x length 245 cm. Pillow cover, width 45 cm x length 71 cm. Other sizes are available on request up to 220 cm wide.